RR Garcia’s career-best output propelled Barako Bull to a big win, while Ginebra extended Meralco’s woes in the 2015-2016 PBA Philippine Cup. Ginebra rebounded from their loss to SMB with a convincing win over Meralco. RR Garcia tallied a career-high 26 points to lead the Barako Bull Energy to their second straight win, trouncing the Mahindra Enforcers, 93-83, in the SMART BRO PBA Philippine Cup Tuesday at Alonte Sports Arena in Binan, Laguna. Garcia also grabbed three rebounds and shot 10 out of 14 from the field for an impressive 71 percent clip as the Energy improved to 3-2. The forward duo of JC Intal and Willy Wilson backed him up with 20 and 11 points respectively. Intal also nailed 3 triples, while Wilson grabbed 13 boards. With the loss, Mahindra, which got a surprising production of 17 points and 20 rebounds from Mark Yee, settled for a 1-4 slate. RR Garcia (BAR) - 26pts, 3rebs, 3asts, 3 triples, 10/14 FGs. Mark Yee (MAH) - 17pts, 20rebs, 2blks, 1ast, 1stl, 6/12 FGs. Barangay Ginebra San Miguel got back to the winning track as they continued the miseries of the struggling Meralco Bolts with an 89-64 win in the SMART BRO PBA Philippine Cup Tuesday at Alonte Sports Arena in Binan, Laguna. Greg Slaughter scored 18 points and 14 rebounds, and he got enough help this time around as Ginebra (2-3) clinched its second win of the conference at the expense of the still-winless Meralco (0-5). Japeth Aguilar also came up with 18 points and six boards, while the Gin Kings got surprise production from Nico Salva who finished with 12 and five. Joe Devance, quiet all conference long, finally made his presence felt with eight points. The backcourt trio of LA Tenorio, Sol Mercado, and Mark Caguioa each made seven markers to complete the balanced attack by Ginebra. 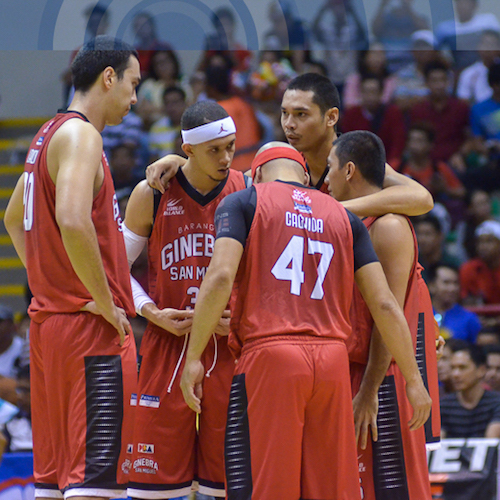 The game was practically done as early as the second quarter when the Gin Kings pulled away. 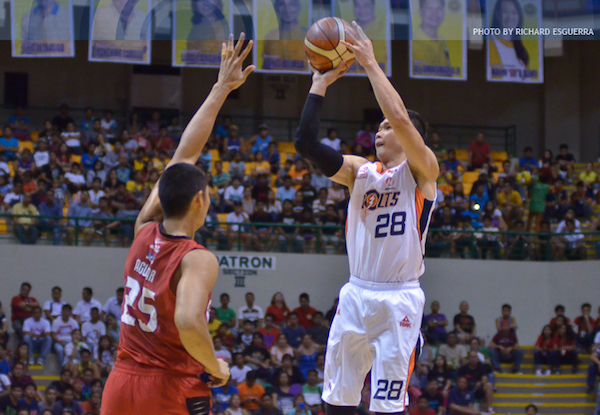 Gary David, who had come off a 40-point explosion for the Bolts last Sunday, top-scored for Meralco but was just limited to 18 as they still failed to get a win. Greg Slaughter (GIN) - 18pts, 14rebs, 3asts, 1stl, 1blk. Chris Newsome (MER) - 13pts, 8rebs, 4asts, 2stls, 1blk. Not even Gary David's shooting could save the Bolts here. 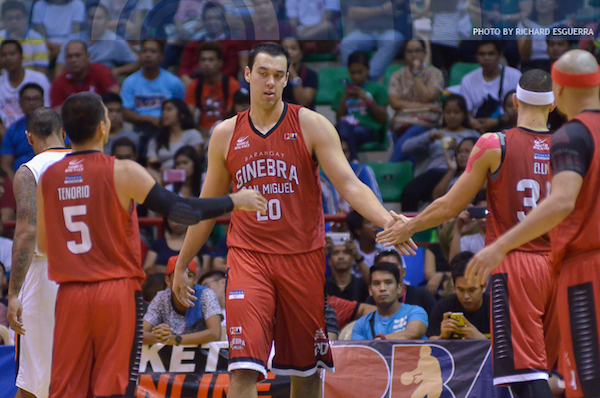 Greg Slaughter put up another monster double-double for the Gin Kings.